Hard work and discipline helps girls outperform boys in class, but that advantage disappears in the work force. Is school the problem? An interesting article. But not even a _mention_ of the _possibility_ that there are underlying reasons for the phenotypic difference. I'm not asking for a lit review. Just acknowledgment that conceivably biology has something to do with it. Women may be overqualified and overprepared for certain tasks/roles, but what might be holding them back? #CONFIDENCE. My daughter asked me tonight if she is smart enough to be an x, y or z someday. We are starting the confidence training now. Strenuously disagree! If women's hyper-conscientiousness holds us back in the workforce then why the hell would we waste so much time and effort being hyper conscientious?!?!? Why Girls Beat Boys at School and Lose to Them at the Office: nyti.ms/2DYFnj2 "What if school is a confidence factory for our sons, but only a competence factory for our daughters?" "We need to ask: What if school is a confidence factory for our sons, but only a competence factory for our daughters? "~ @LDamour in "Why Girls Beat Boys at School and Lose to Them at the Office"
Sorry, I linked the wrong article! "sons do just enough to keep the adults off their backs, while their daughters relentlessly grind, determined to leave no room for error … experience of succeeding in school while exerting … moderate effort …may help our sons develop confidence"
Interesting piece argues that in the work place, confidence often matters more than competence: "Why Girls Beat Boys at School and Lose to Them at the Office"
"... found that a shortage of competence is less likely to be an obstacle than a shortage of confidence." "What if school is a confidence factory for our sons, but only a competence factory for our daughters?" 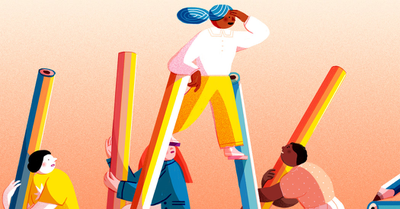 Why Girls Beat Boys at School and Lose to Them at the Office via @NYTimes. “A shortage of competence is less likely to be an obstacle than a shortage of confidence. When it comes to work-related confidence, they found men are far ahead. “ True, this.